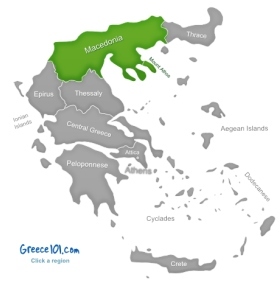 Macedonia is the second largest region in Greece, and the second largest city of Greece, Thessaloniki, is also located there. The region has many mountains and used to be a very important region in the various eras of Greek history (due to its proximity to the borders). About two and a half million people live in Macedonia (do not confuse Greek Macedonia with the country Macedonia). You can get to Macedonia via train, plane, bus, and in your own car. The public transport network in the area around Thessaloniki is very good, but as soon as you would like to visit more remote areas within Macedonia, you need to do some planning as local buses often do not drive late in the evening, and have limited services on the weekends. If you have ever heard of Philip II and his son Alexander the Great, then you will already know about two famous historic figures who came from this Greek region. Being the home of Alexander the Great, who created one of the biggest empires on the planet before he was even 30 years old, is a source of pride for the Macedonian people, and you will come across statues of Alexander the Great frequently when you travel through this region. What makes Macedonia special for a visitor? The best part of Macedonia is the stunning landscape, and the area is well known for the many adventure tourism operators. This makes Macedonia the perfect destination if you like the outdoors, but would also like to explore some archaeological sites. What are the places you should not miss in Macedonia? Bad news first: You can only enter Mount Athos, a state-within-a-state, if you are a man AND have the necessary papers that allow you to enter. It is a rather strict place, but also very beautiful and the people who manage to get in there, will never forget the experience. Mount Athos is fully devoted to the worship of god and filled with monasteries in a stunning landscape. This is not only the highest mountain in Greece, it is also supposed to be the home of the ancient Greek gods and goddesses. 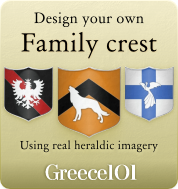 Unfortunately, it is quite unlikely that you will run into Ares, Athena or Zeus when you hike or climb on Mount Olympus. However, the area around the mountain is breathtaking and there are lots of walking tracks that can keep you busy for while. Do not attempt to climb the mountain if you are not an expert climber with plenty of experience, or you might get to meet Hades after all. 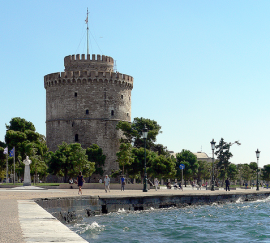 Thessaloniki is the second largest city and Greece, and thus has quite a lot to offer. There are plenty of museums, sights and archaeological sites to explore. A few examples are the Palace of Galerius, the Roman market, the Roman baths, the city walls, the new museum of Byzantine Culture, the Macedonian Center of Modern Art, and the All Nations Baptist Church of Thessaloniki. In addition to all of that, you will also find excellent shopping and nightlife in this lively city. The area of Halkidiki is a paradise for beach lovers as many of the best beaches in Greece can be found here, and especially during the summer months, you will not be able to find many empty beaches. You should also definitely book your hotel in advance if you plan to spend a beach holiday in Halkidiki. Edessa is one of the most beautiful cities in Greece, and it is known as the “City of Water”. When you visit Edessa, you will soon understand where that name comes from, as you will encounter beautiful water features everywhere, and of course there is also the lovely waterfall of Edessa. Or rather the lovely waterfalls, as there is not just one. 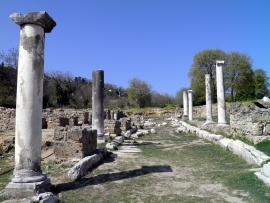 For something more historic, you can also visit ancient Edessa, which is a ruin city. Katerini is very popular with tourists as it is close to Thessaloniki and also provides reasonably easy access to a variety of historical sites like the ancient city of Dion, and the Castle of Platamon. There are also lovely beaches, and you could easily make your way to Mount Olympus from Katerini. This turns Katerini in an ideal base for someone who likes culture but who would also like to go on some outdoor adventures. Polygyros is a city in Halkidiki, which would be an ideal place to stay if you would like to explore the area. 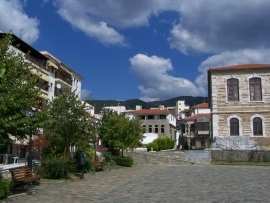 Within the city, you can visit the Archaeological Museum of Polygyros, a church and some lovely squares. Outside of the city, you can explore the area around the mountain Cholomontas, which is covered in a lush oak forest. It is a great area for hiking and watching wildlife. You will also have quite a bit of peace as most tourists who go to Halkidiki will end up lying on a beach instead of hiking in a forest.